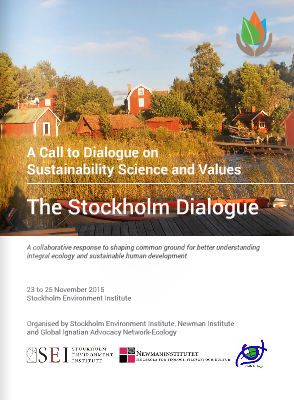 The Stockholm Dialogue that we are pursuing in November 2015, is one of values with science, between those motivated by human spirit and faith and those in the scientific community, and recognizes the work that science is doing and also the growing need to build bridges with broader society in seeking a more sustainable world. 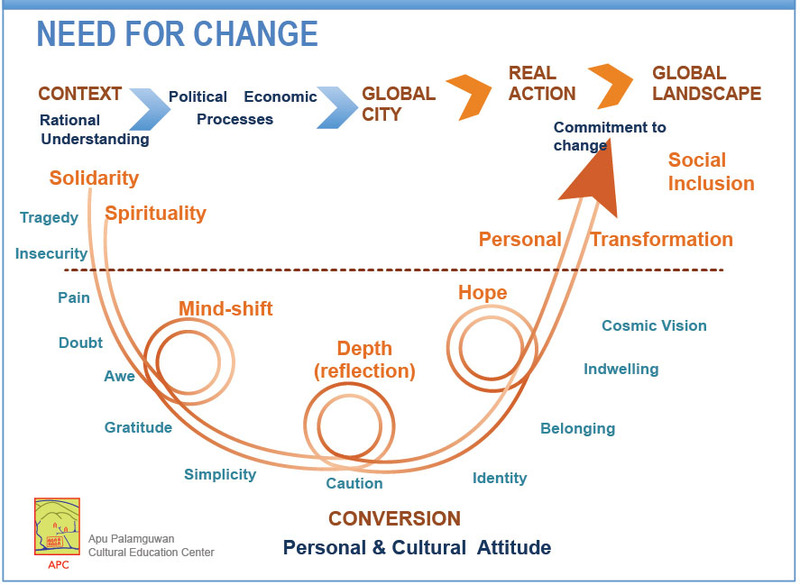 How do we now participate openly and creatively and be part of a new attitude for change? What changes are we looking for and how do we communicate such changes? A deeper understanding of human values that determine people’s decisions in our present global and national systems is critical in guiding us along this transformative process, so as to begin to address the social exclusion that is part of “business as usual.” The process seeks to include the development of social commitment and political will with greater economic accountability. As such, access to water is secured for all, risks are reduced, ecosystems are sustained for the sake of generations to come, and in this way the natural flows of the planet are maintained. While science gives us the rational arguments for guiding global decisions, expressed personal values do transform social agendas that are not simply formed by policy initiatives. Deliberate and conscious efforts to communicate scientific concerns for sustainability are very much needed. This communication is not simply to accommodate realities of current political and economic systems, but to relate with and help in responding to social daily concerns of people. This communication needs to be done in ways that help form or reinforce basic values such as gratitude, solidarity, healing and simplicity, by which societies can and must act. Poverty is in part tied to the landscape, livelihood, and basic family security. People at the margins of society suffer most when environment stress occurs as they are excluded from the broader economic exchange that allows options for sustaining a family life. This means that their livelihood on the land should be viewed in terms of social sustainability, not economic profit. With this in mind and heart, capacity building is a key focus in the call for transformation towards social inclusion. Local governments and enterprises also need capacity to facilitate that inclusion as we move to a deeper human development. The present context of rational and scientific understanding of climate change is not generating political and economic commitment to support the actions needed given the increasing environmental degradation. While many people may be more actively aware and take personal initiative and community venues help in presenting the challenges, these are not generating the economic and political change. There are local developments in responding to a changed climate. Many of these local stories are shared in the dialogue process under values, in an effort to promote a climate for change and give a basis for greater political and economic attitude and action. Our present processes of global negotiations do not allow for the mind shift needed in dealing with the immediate local concerns of many. 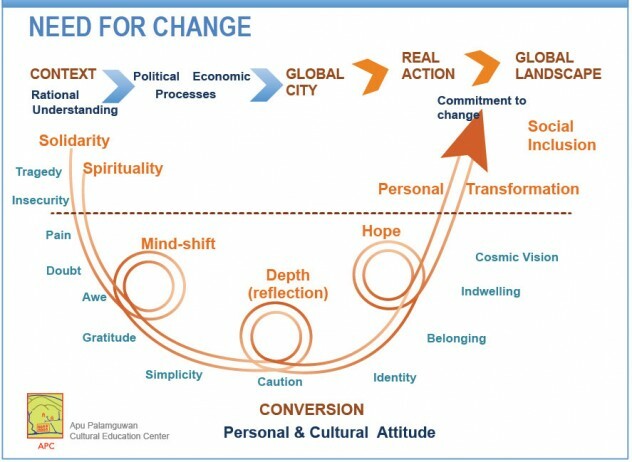 The depth of the realization needed globally to feel connected with the human condition of others, and the hope that needs to be shared through changes in global economic and political systems, are insufficient in developing and implementing the necessary changes. For example, the interests of extractive corporations are displacing tribal communities, weakening cultural systems for decision making, and exerting pressure in fragile environments and cultures even if the economic argument cannot be contested. There is a fragmentation of thinking and deciding, as scientific, economic, and social realities do not meet. Political structures are not designed for effective intervention at the local level as with availability of safe lands for housing, nor at the global as with carbon tax. There is much fatigue among those most engaged in civil society after years of frustration with the present ineffectiveness of global processes and there is a need for broader commitment. The mind has to shift and this is a great challenge, as we must now conceive with creativity and urgency a whole new way of thinking and communicating: how we as humans relate in every detail with the planet Earth. We need to integrate concern and compassion in our daily and institutional living that transforms the moral and ecological outcome of our lives and our societies. To change how we live, we must change how we think. We must change the very framework of how we put all our institutions, communities, knowledge, and needs together. We need to incorporate a greater experience of how humans adapt globally and tap the creativity needed in socially moving beyond the security of predictable ways as defined by present political and corporate “business as usual.” The economy, industry, infrastructure, markets, culture, communications, even how and why we do science, develop laws, and reflect philosophically, must radically relate in new ways. In expressing hope, it is easier to see opportunities and ways forward, bringing more people into the process to help develop a greater context and commitment for change. Fear of the future reminds us of the need for humans, especially the youth, to have a context that builds hope. Without hope, it is difficult to mobilize people toward meaningful action. A key effort is in identifying: one, what generates hope for humankind in a world that is suffering deeply and where threats are great and increasing; and two, the reasons for such a hope. Hope is primarily relational, seeing from a deeper reflection the connections and possibilities for change through better relations. For many, our sense of community is at the core of our hope. We think of these relations as personal, social and institutional; there are also the economic and cross cultural, as the relations are “across” many differences and levels. Hope allows us link the present with the future and share a story of a beautiful planet. Today we know the scientific problems we face on the planet and we must continue with the research and the social adaptation to give hope and help build trust amongst people. Mitigation has its limits in present political and economic systems. There is a humanism that is growing, a human spirit that wants to act and experience with compassion and with others in ways that contribute to a process of change. The challenges of poverty and justice are now relevant both for science and spirituality. Responding to these challenges contributes to a broader global shift in attitudes of greater responsibility, simplicity of lifestyle, and inclusion of the margins.